Obsessed with Zac Brown Band and want to know more about the Zac Brown Band tour schedule? Yeah. We don’t blame you, not one bit. Zac Brown Band is one of the most popular country music bands in the country right now, and for good reason. Their tunes are pleasant to the ear, and those vocals? The perfect melody to soothe our souls as we get lost in the lyrics of Zac Brown Band. But your obsession shouldn’t just stop with endless hours of repeated favorites on your iPhone. Take your love of Zac Brown Band up front and personal and check out the Zac Brown Band tour lineup, otherwise known as The Owl Tour. 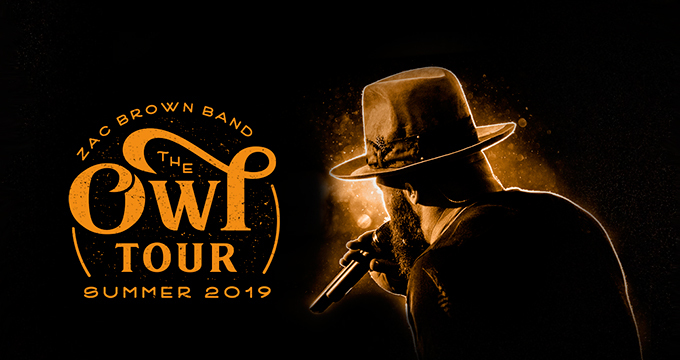 Zac Brown Band has been on a seemingly endless tour since 2018 (not that we want them to end anytime soon), and following their infamous ‘Down The Rabbit Hole Live Tour’ is the ‘The Owl Tour’ set to begin May 25, 2019. The spark of this anticipated Zac Brown Band tour 2019 will take place in Indianapolis, Indiana at the Legends Day - Indy 500. The final date set for the Zac Band Tour 2019 will be held in Dallas, Texas at The Dos Equis Pavilion on October 26, 2019. As far as the Zac Brown Band tour lineup is concerned, there’s a whopping 36 events lined up all across the United States. This means that there is a chance for all Zac Brown Band fans to find a tour location that works well for them. They will begin their trek in Indianapolis, head down the east coast, and shift over to the west coast in mid July. This question is really a no brainer. Zac Brown Band has some of the most unique country music in the niche and fans can’t get enough of it. To put it simply, their performances rock. You get lost in their music almost instantly and they put on a performance that will resinate in your mind for years. With wonderful rhythms and lyrics that hit the heart every time, you won’t want to miss out on the opportunity to see Zac Brown Band live and in action. Wondering who they have booked as the Zac Brown Tour openers? So far it looks like some of the openers on The Owl Tour will be none other than Lukas Nelson and Promise of the Real. With openers like that, how could you resist seeing The Owl Tour live? We’re jumping out of our chairs just seeing the upcoming lineup! If you’re craving to see ‘Someone I Used to Know’ performed live by a band that sends shivers down to our cowboy boots, then you need to jump on the wagon and buy yourself (and ALL your friends) some tickets immediately! Tickets went on sale February 8th, 2019, and there’s still plenty for you. There are several locations across the United States and tickets are always an excellent price when you work with us. Find the perfect tickets and get ready for The Owl Tour this summer and fall!